If you are the type to like your food dainty, neatly arranged and delicately spiced, this recipe is probably not for you. If elegance and order on the plate be your priority then under no circumstances should you even contemplate making and devouring this dish. And if cutlery is your friend or you strive to maintain grace while eating your meals, well then I’m really baffled as to how you even ended up here. If you’re still here, I’m glad you are because if you are willing to overlook the complete and utter lack of prettyness of a dish and place something that looks like homogenous slop in your mouth, then this might just be for you. And if you are game to tear off buttery, toasted bread with your fingers, scoop up some of the aforementioned slop, top it with zingy raw onions, a squeeze of lemon juice and fresh coriander and cram it into your mouth, you may just be glad that you did stick with me here. So if you manage to get that far, what you will probably experience is something akin to a Bollywood street party in your mouth. You know the kind where boy and girl are walking down the street seemingly normally and all of a sudden everyone breaks into song and magically, strangers know all the steps to the dance? Yup, just like that but on your tongue. And if you’re still tuned in, I promise you won’t regret it. Pav Bhaji is an Indian street food that originated in Mumbai and is now consumed by hungry folk on street corners all over India, as well as in restaurants the world over. It is a kind of spiced stew, crammed full of vegetables bound together by mashed potato. It is the mashing, the cooking, the stirring, followed by more cooking allows the vegetables to absorb the spices so beautifully. When this smoothly spiced bhaji meets buttery toasted bread, it really feels like, at least in that moment, all is right with the world. In our family home, although my dad can cook, it is my mum who does most of the day-to-day cooking, like this dish. But pav bhaji? This is undoubtedly my dad’s domain. A meticulous vegetable chopper, dad first chops all the vegetables in a perfectly even dice, then proceeds to combine it all together in a simmering pan while the spices develop their flavours, slowly but surely. So we wait patiently, the aroma making it almost impossible for us to focus on our pre-dinner tasks, until finally dad dishes up the delicious bhaji along with pan-toasted bread as well as the accompanying chopped onion, coriander and wedges of lemon. 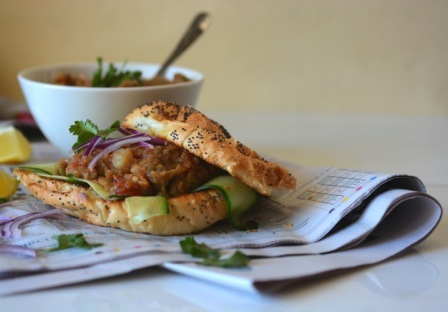 We normally use store bought bread rolls to pile the bhaji onto, but if you would like to try making your own, Sneh from Cook Republic has a recipe. Place the potatoes in a pot with 1/2 salt and enough boiling water to completely cover them. Boil until just cooked through. Drain and set aside to cool. Chop all the vegetables as described and soak the frozen peas in boiling water. In a large non-stick wok or fry-pan, heat the oil on moderate heat. Add the cumin seeds and when most of them have popped, add the chillies. Fry, adjusting heat to prevent the seeds from burning, for 1-2 mins. Add the spices except for salt and amchur and cook, stirring for 3-4 mins. Add both types of capsicum and fry for 5-6 mins. Add the onions and fry until the onions are translucent. At this point, add 1/2 cup water, cover and cook for 3-4 mins. The capsicum should be just cooked through by now. Add tomatoes, carrots and peas and another cup of water. Add 1 1/2 tsp salt and stir through. Cover and allow to cook on low heat until carrots are cooked through and tomatoes are starting to go mushy. While this is cooking, peel the cooked potatoes. Much of the water may have evaporated by now. Add the potatoes and another cup of water. Use a potato masher to roughly mash the mixture in the pan. Keep it fairly chunky- don’t aim for a mashed potato consistency, but enough of the potato should be mashed to homogenise the mixture. Cook for 2-3 mins. At this point, you should taste and add more chilli powder, salt or amchur (for sourness) according to taste. Cover and cook for 15-20 min, on low-medium heat, stirring every few mins. The mixture should be quite loose during this process, like a very thick soup. Add water as you cook to maintain this consistency. Finally, add 50 grams butter, cubed and stir through until melted and the mixture thickens a little. Cook uncovered, stirring for a further 5 mins. Take off the heat and allow to sit for a few mins before serving. Slice the buns into half through the middle as you would for a burger. Butter the bread generously and fry, cut side down in a non-stick fry-pan until toasted. Use this method rather than using the toaster or grill- trust me on this one! 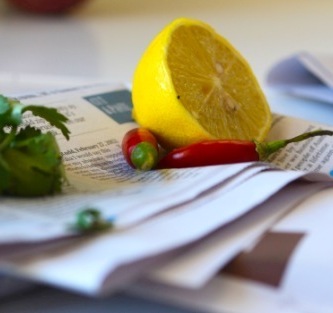 Serve bhaji with a sprinkle of raw chopped onion, coriander and a good squeeze of lemon juice, and bread on the side. There are 2 ways of eating this- either pile the bhaji onto the bread and eat like a pizza or tear off pieces of bread and spoon/scoop the bhaji onto it. Either way, ditch the knife and fork and use those fingers! Pav bhaji masala, garam masala and amchur powder are available at Indian grocery stores. Garam masala is also available in mainstream supermarkets. You could make this dish vegan by using vegan spread instead of butter, or by skipping the butter altogether. I’m all set to go to bed right now but this post just woke me up! My tongue is salivating. I need some good pav bhaji in my life! 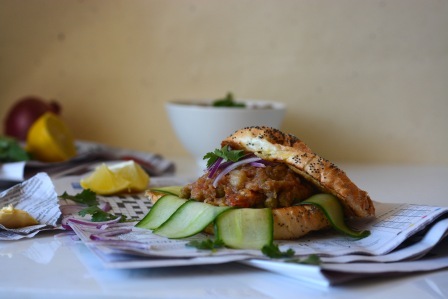 I will definitely make this… As soon as I buy pav bhaji masala. Any particular brand you recommend? Ahhh then my work here is done! Thanks for the kind words Zarine. You should definately give it a go and let me know how you get on. As for the brand, I’m not sure what is available in the US but here Mangal brand is quite good and I used MTR the other day which was good. I think you can get MTR worldwide? Hey Deepa, Russell from Meetup – thanks for Sharing your Babble :), I can’t pronounce it but can you show how to make galubgamin?? it’s a very sweet dessert afterafter Mango Lassi my absolute favourite. Hey Russell! I have a shameful confession…..I’ve never actually made Gulab Jamun as I’m not a big fan! But leave it with me and I’ll try and find you a good recipe. Thanks for dropping in! Oh dear, this looks sooooo good. And I’ve added you to the list of food bloggers, thanks. Wow that was quick, thanks Thang! And for the kind words. It is it is!! You gotta try it- it takes a while to cook but it’s not very tricky to make. Thanks for dropping in by the way! I love the look of this! Especially when you described scooping it up onto that bread – yummo! 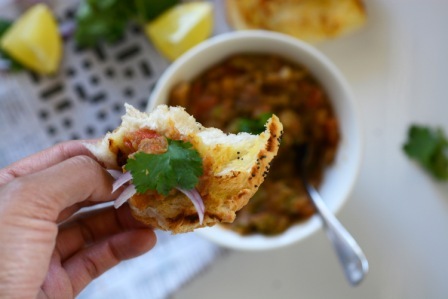 oh my, I’m one of those people who LURVES pav bhaji – I have a batch sitting in the fridge right now and I eat it at every meal – breakfast, lunch and dinner! and last night, it was also my late night snack! I just chanced on a very authentic recipe from Juhu beach (in bombay) where I ate it often – was planning on posting about it myself. 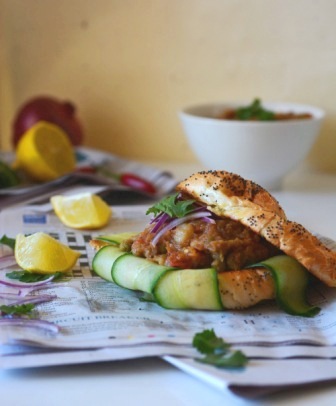 Whatever the recipe, there is no wrong pav bhaji in my book! Agreed! Im so jealous you have some in your fridge look forward to seeing your version. Hi Deepa, I only found out about this dish today while looking for a Tawa Pulao recipe, I was googling to see if Mangal brand Pav Bhaji Masala was anygood as it was the only Pav Bhaji brand at my local Indian Shop, so you answered my question right there, thanks. Im just wondering as to why you dont use Garlic or Ginger in your recipe? All the others I found use it. I will be using it tonight as I couldnt handle an Indian without them, but yours still indeed looks delicious! Hi Vadge, thanks for the feedback. I asked my dad the same qn as I too would ordinarily put fresh ginger/garlic in. However he developed his recipe without it and I wanted to stay true to his recipe. I’m sure it would work well with the addition though!